How Do You Spell Scaffolding? 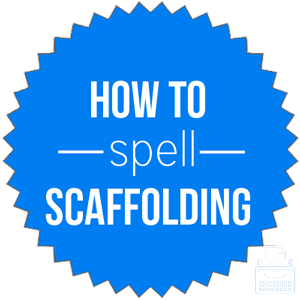 Home » Spelling Dictionary » How Do You Spell Scaffolding? Spelling of Scaffolding: scaffolding is spelled s-c-a-f-f-o-l-d-i-n-g. Definition of Scaffolding: Scaffolding is a noun that refers to a system of scaffolds, or the material, including metal poles and wooden boards, used to construct or support a scaffold. Scaffolding is commonly found on new construction sites where workers will build up scaffolds as they progress on a particular job. Aside from new construction, it is also commonly used in rennovation projects, painting projects, and window washing. Pronunciation of scaffolding: scaffolding is pronounced skaf-fol-ding. What does scaffolding mean? The word scaffolding is a noun referring to a network of scaffolds or platforms, or the materials used to build scaffolds. First, they must construct the scaffolding before they can start constructing the main structure. In total, there were 4 stories of scaffolding towering beside the building while the workers applied the last coat of paint. Without the “-ing,” the word becomes scaffold, which is both a synonym of scaffolding, as well as a verb referring to the construction and attachment of scaffolding. Scaffold as a verb is extremely rare, however. As a noun, scaffold is not just a synonym for scaffolding, but it also refers to the platform on which criminals were executed, or any raised framework or stage. They built a scaffold tower to support the building. The criminal approached the scaffold and acknowledged the executioner. There are no common phrases or idioms that use the word scaffolding. The first known use of the word was in the 14th century, according to Merriam Webster’s. It comes from Middle English scaffot, skaffaut, scaffalde, which comes from the Old French word escadafaut. There are really no words that are exact synonyms of the word scaffolding, but there are words that may be used to refer to a similar structure. Scaffolding is a noun that refers to a scaffold or framework, or the materials used in the construction of a support platform.